Within both the federal government and the private sector, there is a growing need for environmentally safe and cost-effective solutions capable of removing paint and coatings from a wide range of surfaces including steel, aluminum, concrete and composites. PlasmaBlast™ is the next generation of coating removal and surface preparation technology that represents a significant step forward in developing environmentally responsible methods for coating removal. Tested in U.S. government trials, PlasmaBlast is found to be a safe and effective alternative to media blasting and wet abrasive blasting. 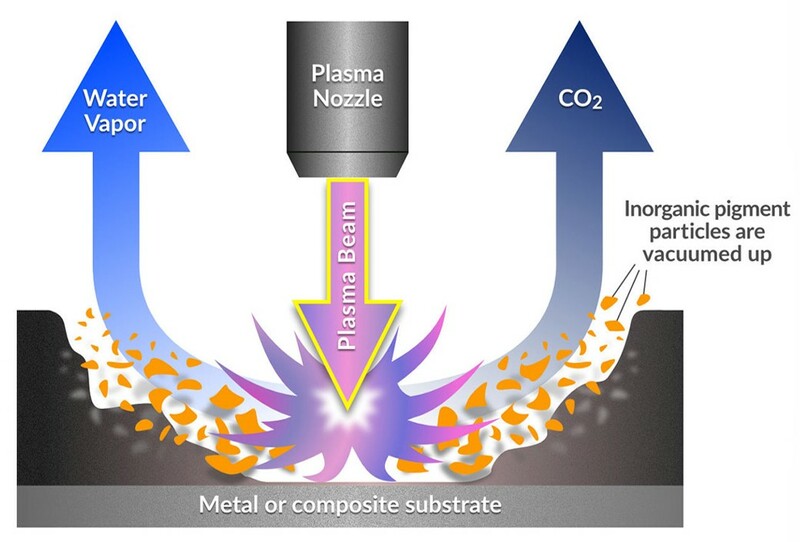 The PlasmaBlast system, which requires only compressed air and electricity to operate, creates a concentrated, low-temperature air plasma beam. This beam can be used for rapid coating removal without the use of any media, virtually eliminating the need for containment. 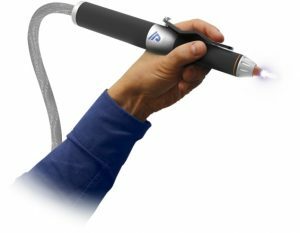 Single or multiple plasma beams may be configured for handheld or machine-mounted use to prepare a variety of substrates. The coating removal and cleaning process converts the organic components of most paint, sealants, and protective coatings into carbon dioxide and water vapor. Inorganic constituents of the coatings, such as pigments, are then recovered as a fine dust. PlasmaBlast presents a novel technology to remove coatings from virtually any substrate material. The system has been demonstrated to be an effective alternative to media and wet abrasive blasting on a wide range of surfaces and coatings found in the US Navy, Air Force and other Department of Defense (DoD) service branches, in addition to a wide variety of commercial applications. PlasmaBlast PB-Series is the world’s first plasma-based coating removal system to be based upon the proprietary PlasmaBlast technology. The PB-Series quickly and safely removes paint, sealants, adhesives and other protective coatings from a variety of surfaces. PlasmaBlast eliminates the costs and hazards of using aggressive solvents or abrasives, and avoids the collection, treatment, and disposal of dangerous by-products of coatings removal. PlasmaBlast’s portability and light weight significantly lower costs and improve productivity when removing paint and other coatings from a wide range of surfaces across a variety of applications.